The Supreme Court has begun hearing an important case on the issue whether a statement recorded under Section 67 of the Narcotic Drugs and Psychotropic Substances Act, 1985, Act can in law be a confessional statement or not. 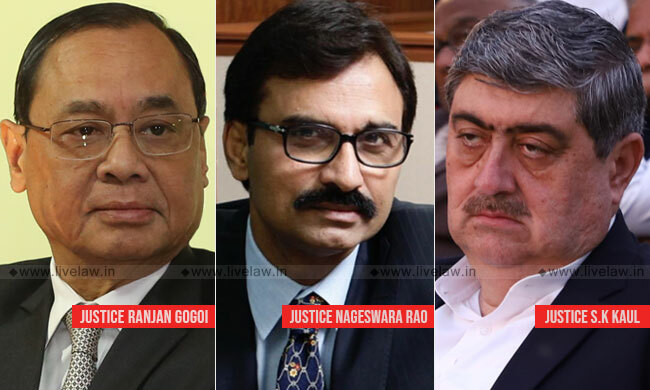 The hearing of the reference in Tofan Singh vs. State of Tamil Nadu by the bench comprising of Chief Justice Ranjan Gogoi, Justice L. Nageswara Rao and Justice Sanjay Kishan Kaul on last Friday, continued today also. The bench will continue hearing the matter tomorrow as well. In July, last year, the bench headed by Justice Ranjan Gogoi, had made an observation in an order that a large number of cases in the apex court and various high courts in the country are awaiting the outcome in that case to know determination of the three-judge bench in the issue whether a statement recorded under Section 67 of the NDPS Act can in law be a confessional statement or not. It then had required the Registry to bring it to the notice of Chief Justice of India that reference made in Tofan Singh vs. State of Tamil Nadu is still pending. It had observed: "As the said reference i.e. Tofan Singh (supra) has been pending since October, 2013 and we are told that a large number of cases in this Court as well as in various High Courts in the country are awaiting the outcome in Tofan Singh (supra), we direct the Registry to place this order before Hon'ble the Chief Justice of India for appropriate orders for hearing of the issues referred in Tofan Singh (supra)." Meanwhile, in a judgment delivered July, last year, another bench of Supreme Court has held that conviction under NDPS Act cannot be based solely on the confessional statement of a co-accused, in the absence of a substantive piece of evidence. A bench comprising of Justice AK Patnaik and Justice AK Sikri, in 2013, doubting the dictum laid in Kanhaiyalal vs. Union of India, referred these issues to the larger bench. -Whether the officer investigating the matter under the NDPS Act would qualify as police officer or not? -Whether the statement recorded by the investigating officer under Section 67 of the Act can be treated as confessional statement or not, even if the officer is not treated as police officer? It had observed: "We have also to keep in mind the crucial test to determine whether an officer is a police officer for the purpose of Section 25 of the Evidence Act viz. the "influence or authority" that an officer is capable of exercising over a person from whom a confession is obtained. The term "police officer" has not been defined under the Code or in the Evidence Act and, therefore, the meaning ought to assessed not by equating the powers of the officer sought to be equated with a police officer but from the power he possesses from the perception of the common public to assess his capacity to influence, pressure or coercion on persons who are searched, detained or arrested. The influence exercised has to be, assessed from the consequences that a person is likely to suffer in view of the provisions of the Act under which he is being booked. It, therefore, follows that a police officer is one who :-(i) is considered to be a police officer in "common parlance" keeping into focus the consequences provided under the Act. (ii) is capable of exercising influence or authority over a person from whom a confession is obtained." In this case, a two judge bench had held that an officer for the purposes of Section 67 of the NDPS Act read with Section 42 thereof, is not a police officer, and thus the bar under Sections 24 and 27 of the Evidence Act cannot be attracted. The bench had further observed that the statement made by a person directed to appear before the officer concerned may be relied upon as a confessional statement against such person.